Tungaloys high-feed DoFeed milling line has transformed the way manufacturers think about milling. 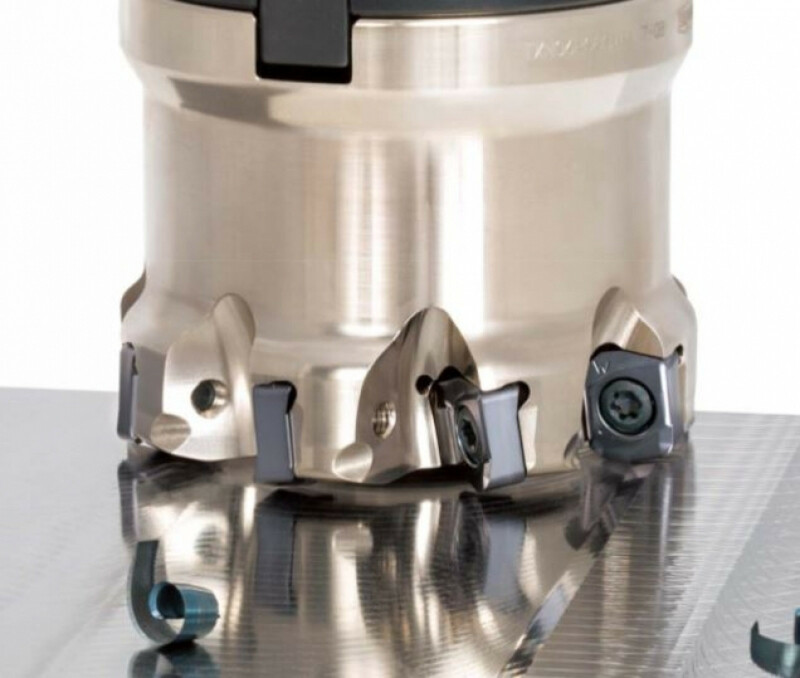 The impressive line of flexible and versatile tools offer advantages far beyond that of most milling tools. The DoFeed has been designed to dramatically reduced cycle time and cost, extend tool life and improve component quality. Tungaloy's high-feed milling line is potentially the most extensive in the industry and it is no wonder why DoFeed is one of the most popular milling tools in the Japanese manufacturers full product line. In todays hyper-competitive machining market, cycle time plays a major role in productivity and often determines the profitability of a given job. Simply increasing the speed or revolutions per minute (RPM) may appear to decrease the cycle time. However, reduction in cycle time would be converted to time to change inserts since the increased speed or RPM shortens tool life, which increases the tool cost at the same time. Tungaloy claims the DoFeed Series is the solution for this problem. The tool works at elevated feed rates with modest spindle speed to provide reduced cycle time and extended tool life. Working on the chip thinning principle that depends on the lead angle of a milling cutter is where the DoFeed succeeds. A cutter with a 90° lead angle has no benefit of chip thinning as 0.2mm/t of feed per tooth only delivers the same 0.2mm of chip thickness. In case of a cutter with a 45° lead angle, 0.25mm of feed per tooth creates 0.178mm of chip thickness, which allows the feed to be increased, resulting in reduced cycle time. As for the DoFeed, it achieves 1.27mm of feed per tooth and it provides chip thickness of only 0.178mm, decreasing cycle time by 50% or more. Low cutting force is also an advantage of the DoFeed. The lead angle on a cutter decides the direction of cutting force. A 90° cutter will produce cutting force that acts perpendicular to the spindle, putting incredible pressure on the tool. As for a 45° cutter, cutting force goes toward the spindle at 45° angle. With DoFeed, cutting force is almost parallel and directed back to the spindle due to its acute lead angle, this means less pressure to the spindle. Thus, DoFeed is suitable for long-reach applications too. Because DoFeed cutters can machine multiple hole diameters and produce counter bore and countersink in the same operation, there is no need to change tools and purchase multiple tools. As a result, significant time and cost saving will be achieved. This characteristic is ideal for 3D machining on a complete variety of material types.